Hello Motivation! WHERE ARE YOU???!*#! OMG! I am so unmotivated! Can’t seem to make up my mind on what and where to start! I haven’t painted that! I would love to be able to paint like this! 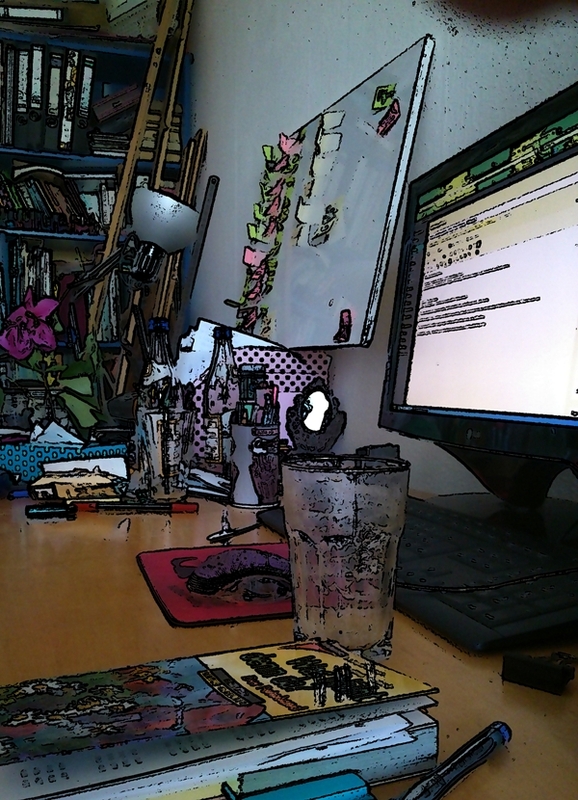 It’s just the photo software and a pic of my messy table. I made myself such a beautiful plan of tasks to reach goals , full of post-it papers in all colours and precisely sorted. How to get motivated? I am even too unmotivated in doing nothing!!! The sun is shining and it is warm outside, the best weather to go out in the parc and collect herbs. I haven’t put in place yet and step around piles of clothes on the floor that I have to sort out. My work space is full of piles of paper, empty bottles and dirty dishes, books, pens, full ashtray. And tonight there is a party, I wanted to go to. Even this free time amusement IS STRESSING ME OUT!!! I could just start with doing ONE thing, that will uplift me. But…. See, my bad mood is rising clouds outside! Maybe it will rain? So I cannot go and collect herbs today!!! ISN’T IT REALLY STRANGE THAT EVEN THE THINGS THAT ARE FUN TURN OUT TO STRESS ME OUT??? AND THAT I CAN’T GET MOTIVATED EVEN FOR FUN THINGS??? And the other thing is: I actually know how to help myself, I could burn some incense, get some essential oils that will get me motivated, but WTF!!! I am especially unmotivated in helping myself! I will leave you and me here without any solution, no advice…just an unmotivated mood! Hey see, I actually got motivated to write this post, at least! Hurray??? ← ADHD & Hypersensitive: Come On Baby, Shake It! Hey, I know how you feel. I have it too. I like the way you write and have decided to follow. And thanks also for the link, the first words already sound great and made me laugh! Btw: You make amazing artwork, love Your blog and art! Check out the motivation vs. ACTIVATION articles on my blog – an important EFD reframe of “procrastination.” To locate, use the LinkList and Brain Transplants dropdown list at the top of each page (bottom menubar, next to “SiteMap,”, slide down to Activation and click. You’ll see links to the Series in process, and can pick and choose the ones that peak your interest). Keep writing! I’m not kidding when I say I sometimes look up my own articles to remind me of what I know but can’t access in the moment. I heartily recommend rereading your own stuff! thank You very much for Your recommendation to your articles. I will soon read them. And yes , it is really interesting to reread my own articles-and find my own knowledge that I lost or forgot somewhere!lol 😀 Thanks for reminding me.